If love is a malady, the Spinster House ladies have caught it, one by one. Contains mature themes. Miss Jane Wilkinson couldn’t be more delighted when her two best friends marry, creating a much-desired vacancy at the Spinster House. For the first time in her twenty-eight years, Jane can be free of her annoying older brother and enjoy complete solitude—with the exception of the Spinster House cat, Poppy. 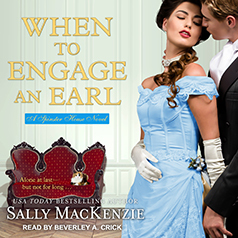 If only Jane’s unruly thoughts didn’t keep drifting to handsome Alex, Earl of Evans, in the mostun-spinsterlike ways . . . Though jilted once, Alex has always intended to marry and raise a family. Now that his two closest friends have tied the knot, he is more determined than ever to find a wife. If only it wasn’t the intriguing Miss Jane Wilkinson that his heart—as well as the rest of him—desired. Not only does she appear uninterested in marriage, it’s clear she’s the managing sort. And yet, despite Alex’s fiercely independent spirit, the idea of being managed by her is quite appealing. Now if he can only convince her to give up her beloved Spinster House in favor of a far more pleasurable home—in his arms . . .